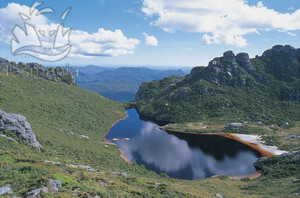 South West National Park is in Tasmania. 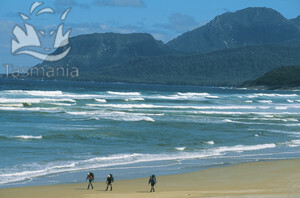 It is the largest, wildest and most remote national park in Tasmania. It contains some scenic drives and short bushwalks as well as some of the longest bushwalks in Australia. It is recommended that you do the Overland Track in the Cradle Mountain Lake St Clair before you attempt those, as they are very remote and the help would be far away if you needed it. By AllPosters, click on thumbnail to buy. There is a brilliant way to see the less accessible western coast of Tasmania!!! One of the last temperate wilderness areas in the world, the park contains many mountain ranges, some beautiful wild rivers, button grass plains and cool temperate rainforests. Native vegetation includes some rainforest species like myrtle, sassafras and celery top pine. Wildflowers and berries are seasonal, and include leatherwood, silver wattle and snowberries. Geology of the mountain ranges can be different. The towering Mount Anne (the highest peak in this park) has the typical dark dolerite peak while the surrounding ranges consist of grey quartzite. This wilderness of course comes with many wild animals – you can see Tasmanian Devils, platypuses and echidnas, common wombats, sugar gliders and ringtail possums here, and in different parts of the park there are a few local highlights, such as the orange-bellied parrot in Melaleuca and the sea pens of Bathurst Harbour. Birds include currawongs, green rosellas, yellow throated honeyeaters, Tasmanian native hens, masked lapwings, yellow and little wattlebirds, common bonzewings, Tasmanian scrubwrens, thornbills and yellow tailed black cockatoos. Tasmanian Devil. By AllPosters, click on thumbnail to buy. The main entrance to the park is along the Gordon River Road which passes the Mt Field National Park west of Hobart. It is a great scenic drive, with a few picnic spots and good lookouts where there are some views of the surrounding Saw Back and Anne Mountains, and Western Arthur and Frankland ranges. In the end of the Gordon River Road you come to Strathgordon, the former constructuion village of the Middle Gordon hydro-electric power scheme, built in 1960s and 70s. You can stay at the Lake Peddler Motor Inn, on the Teds Beach just south of the town where there is a boat launching area where you can also go fishing and boating. Further west from Strathgordon you can visit the Hydro-electric Commission visitor centre and Gordon Dam and Power Station. Back towards east along the Gordon River Road, there is first the Wedge River Camping Ground with picnic facilities, and then there is the turnoff to Scotts Peak Road – another scenic drive that goes south and takes you to many bushwalks. Not far from the turnoff is the Creepy Crawly Trail – a short (20min return) bushwalk through some nice cool temperate rainforest with some huge logs and trees covered in moss. The track is fully boarded but there is a bit of stair climbing involved. Further south, the scenic Scotts Peak Road. It’s unsealed and can be a bit rough at times. It passes by a few lookouts of the Lake Peddler; and there are also the starting points of two bushwalks to east towards the beautiful Mt Anne. 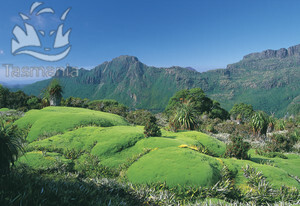 The Eliza Plateau Walk (5-6hrs return) starts from Condominium Creek Car Park and climbs a ridge to the plateau. It is a bit of a climb so you need some fitness. About 10km further south along the Scotts Peak Road, there is the Red Tape Creek and the start of Lake Judd Walking Track (8hrs return). Lake Judd is a beautiful glacial lake well worth seeing but as the track is poorly marked, you need some bushwalking experience. The track first goes to Anne River Cable Crossing, and then crosses a muddy plain until it comes to a junction, where you have to turn left to get to the lake. Further down along the Scotts Peak Road is Edgar Dam where you can go fishing and boating, and finally, in the end of the road is the Scotts Peak Dam. There is a lookout towards the Western Arthur Range; and the Huon Campground. It’s a nice place for a picnic, and the start of the long walking tracks towards the Arthur Plains and Port Davey. But you can also do a short walk from the Huon Campground to the start of the long Port Davey Walk (1-2hrs return) through some beautiful rainforest. But if you came here to do some serious bushwalking, you can either walk the long (50km) walk to the Arthur Plains in east, which takes you to Tahune Forest Airwalk; or you can head south towards Port Davey and Bathurst Harbour (70km). Both walks are great but you have to be very well prepared and carry your tent, warm waterproof clothing, fuel stove (no fires) and a compass and a map. The Port Davey Track takes 4-5 days and there are no walkers’ huts along that track. There are some muddy and steep sections along that track. It takes 3hrs to walk from Scotts Peak to Junction Creek; 8hrs from Junction Creek to Watershed Camp; 5hrs from Watershed Camp to Spring River; and 10hrs from Spring River to Melaleuca. There are camping sites at Junction Creek, Crossing River, Spring River, Bathurst Narrows and Melaleuca. You can either fly out from Melaleuca to Hobart, or you can continue walking along the South Coast Track to Cockle Creek (6-8 days). North of Melaleuca on the Port Davey Track you have to cross the Melaleuca Inlet by boat. The Bathurst Harbour east of it and the Port Davey in the west are beautiful, and contain some interesting marine animals like sea pens that usually live in much deeper waters. Watch out for the rare and endangered Orange Bellied Parrot here. If you go to Melaleuca, there is a bird hide where you can see them. Melaleuca is a very remote spot – there are no roads that would take you there, the only way to get there is either by flying, sailing or walking. There is no accommodation in Melaleuca other than two walkers’ huts that accommodate about 20 people, but you have to be self sufficient. There is water available but you have to have your own food and cooking gear. There are no more huts if you continue along the South Coast Track. Remember to register yourself at the Walkers Registration at the start of the track. 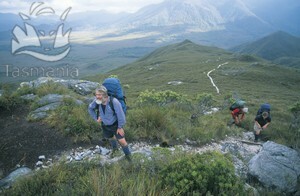 From Melaleuca, the track crosses some plain country south towards the Southern Ocean. At the Cox Bight there are two camping grounds. Then the walk turns east and there is a bit of a climb to Red Point Hills, after which the track descends again and crosses Louisa Plains. There is a camping ground in the end of the plains, and make sure you have a good sleep because the following day you have the steepest climb during the whole walk, across the Ironboud Range. 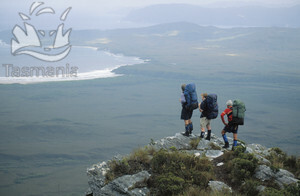 After the 1000m high range the walk descends again, and there is another camping ground right after it at Deadmans Bay. After the Deadmans Bay there is a long walk along the beach, which ends with a boat crossing at New River Lagoon. There is a camping ground there. The walk then follows the coast east across some plain country until you come to Surprise Bay where there is a bit of a climb across the Shoemaker Point where there is another camping ground; and then descends again to the Granite Beach. There is another camping ground just before the climb up to South Cape Range (the second steepest climb during the track), after which you descend to South Cape Bay. There are two camping grounds along the track in that bay, and then you cross the Whale Head peninsula and come to Cockle Creek in Rechercher Bay. Just before the Whale Head Peninsula, there is South East Cape – the southernmost point of Australia. It is so remote however that there is no walking track that goes there, and the way to the cape is impassable. There are camping grounds at Cockle Creek, Gilhams Beach, Finns Beach and Catamaran River. You still have a fair way to Southport, but at least from now on, there is a road driveable by cars. Here's a map where I have tagged the places that I mentioned on this web page. You can click on the tags to see what places they are, and double-click anywhere on the map to zoom it in and see the places closer. Drag the map to move around, and if you want to see the satellite image with Google Earth, click on "Sat" in the top right hand corner. Been to South West National Park?